Pants are some of the most expensive garments in your wardrobe, so when your favorite pair rips, you're naturally reluctant to throw it out. If you know how to sew, you don't need to replace your pants or send them away for professional mending. Large, odd-shaped holes tend to look better when patched, but if the tear is thin or small, you can fix it with only a needle and thread. Cut away the frayed threads surrounding the tear using a sharp pair of scissors. Do not cut into the fabric itself. Cut a piece of thread that is a few inches longer than the tear. Hold a medium-length sewing needle by the tip with the eye pointing up. Moisten the eye of the needle, if desired. This will make threading the needle easier. Grasp the end of the thread and guide it through the eye of the needle. If you have trouble doing this, try holding the needle and thread against a contrasting background to make them easier to see. Alternatively, apply a small amount of beeswax to the end of the thread. This stiffens it, allowing it to slip through the eye. Tie a knot at the end of the thread so it stays secure in the fabric. Insert the needle into the pants from the inside about 1/2 inch to the right of the tear. Pull the thread through the tear to make an upward stitch, then turn the needle down. Pull it through the tear to the left of the first stitch to make a downward stitch. You may need to make some stitches longer than others depending on the shape of the rip. Continue making stitches until you reach the end of the tear, then pull the tread taut. Make a few tiny stitches to about 1/2 inch past the left end of the tear. Pull the treat taut again to make the stitches look almost invisible. Cut or untie the thread from the needle. Tie a knot at the end of the thread to secure the stitches. If you cannot get your thread through the needle, consider buying a self-threading needle. This needle features a notch at the top that allows for easier threading. If the tear in your pants is very large, consider sewing a patch over it. Not all ripped pants are worth mending. 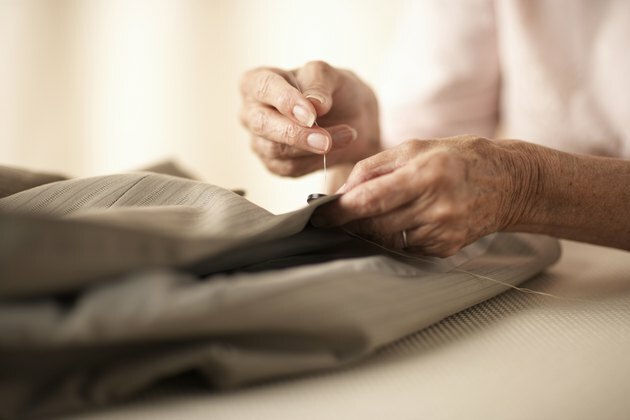 If the repair looks large or difficult, you may want to replace the garment. If, however, the pants were expensive or have sentimental value to you, attempt the repair or have them professionally mended.